Tweet for Freedom in Turkey: Say No to the Criminalization of Dissent! 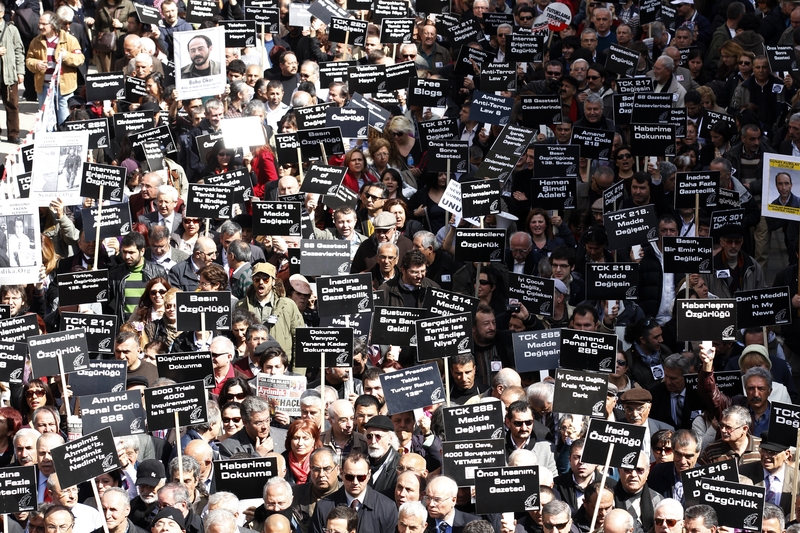 Journalists and activists participate in a rally for press freedom and against the detention of journalists under anti-terrorism laws in the capital of Ankara (Photo Credit: Ümit Bektas/Reuters). In a major report this week, Amnesty International has outlined the wide range of legal tools that Turkish authorities have used to target political dissent and limit freedom of expression. Scholars, students, journalists, human rights activists, and thousands of others have been subject to prosecution and lengthy punishment under these statutes. But you can join us in working for real reform in Turkey! The most negative development in recent years has been the increasingly arbitrary use of anti-terrorism laws to prosecute legitimate activities including political speeches, critical writing, attendance of demonstrations and association with recognized political groups and organizations – in violation of the rights to freedom of expression, association and assembly. In Turkey, famous artists, like Fazıl Say and elderly grandmothers, like Sultani Acıbuca, must equally watch what they say for fear of state prosecution. The Turkish government is currently considering a set of judicial reforms that it says will address these issues, but the truth is that the reforms currently envisioned are insufficient. It is vital that we take action now to push the Turkish government to make the real reforms necessary to end its criminalization of dissent. Take action! Your help is vital in calling attention to this issue. Call on friends and family to help too! Collective action makes a difference! This is a historic moment for Freedom of Expression in Turkey, and we need your help to make a difference. Follow our work on Facebook or at our blog and consider joining Amnesty International – USA’s Turkey Regional Action Network. There is a lot of work to do, but we’re just getting started! This entry was posted in Censorship and Free Speech, Europe and tagged amnesty international, anti-terrorism laws, Erdoğan, Fourth Judicial Package, freedom of expression, human rights, human rights defenders, Journalists, security with human rights, students, Turkey by Howard Eissenstat. Bookmark the permalink. I have started a Twitter account for this. I fully support you and I want to help in whatever way I can. I recently met a group of Turkish people and I was amazed by the fact that they didn't really know much about this. I would have expected them to talk to me about these problems for hours and hours. Freedom of speech is very important and I think it is an essential part of what makes us dignified human beings. If tweets will help then know that I'm doing my best. I'm sorry I can't do more, but at least I can do this. This terrible law does not only attack Turkish citizens, it attacks anyone, foreign visitors and tourists alike, even if you cant speak the language, all it takes is one disgruntled Turk who doesn't like you or your religion to accuse you of it and you will be arrested. This is what happened in the book "run toward the blazing sun"
the true story of 8 British tourists forced to run and escape from that country after their tour operator was falsely accused of Insulting the Turkish government under Article 301.